They say music is the universal language. No matter where you are in the world, music has the ability to change your mood, experience and adventures. This is exactly why we decided to interview the Beroots Bangers. They are a Spanish hip hop underground group stemming from Barcelona, Spain. The group consists of Zemo, Enes, Drako & Ru Ondo. Collectively the group represents dirty underground hip hop in Barcelona, whilst they do only rap in Spanish & French, there is no denying their talents with their track “Underground” receiving over 300, 000 hits on YouTube. Having recently released their “Mainstream is Dead” album, I caught up with Enes to chat about the lack of hip hop following in Spain, their forthcoming album “Todo bien” and a concept album called "Booshido." Margaret Tra writes. For those who don't know The Beroots Bangers, who are you guys? We are a Spanish rap group from Barcelona, we sing in Spanish and French. Beroots is little bit more than a group; in fact we cook all the types of creation including production, raps, records, mix, mastering. This is all self-made at LaineREC Studio which is our own recording studio. Does Hip Hop have a big following in Spain? Not as much as the US or France for example. Spain doesn’t have as many immigration and minorities than others countries (at less not an old one), so I think rap music doesn't have a real place for making roots here. I mean, hip hop music, is not only about ghetto music, but the foundations, the old school used to flourish there. Things are starting to change, and step by step its start to be a mass culture. How did the Beroots Bangers start? Zemo and I (Enes) met 10 years ago for a feature in Zemo "Innovation" album. We met again 4 years ago for a respective feature in my album, and his one. When we saw the results of both tracks we said "Damn, that's got potential, let's do something". So then we started to prepare an EP, and 2 years after ye got a 1h11 LP. At the really end of the LP preparation we integrate Drako (Third MC) and Ru Ondo (DJ) to the official formation of the group. Damn... there are too many things to say about the album. The first thing, is like I said before the album is a 100% self-made product, from the writing to mastering, to promotion and distribution. We put a lot of love in the album and try to give special attention to all the details, like an old hip hop album, with interludes, intros, outros and all that kind of freaky things I used to love from CDs when a was young. I understand you guys rap in Spanish and French? Can you please explain how that works? Do you guys rap in English too? We don't rap in English. 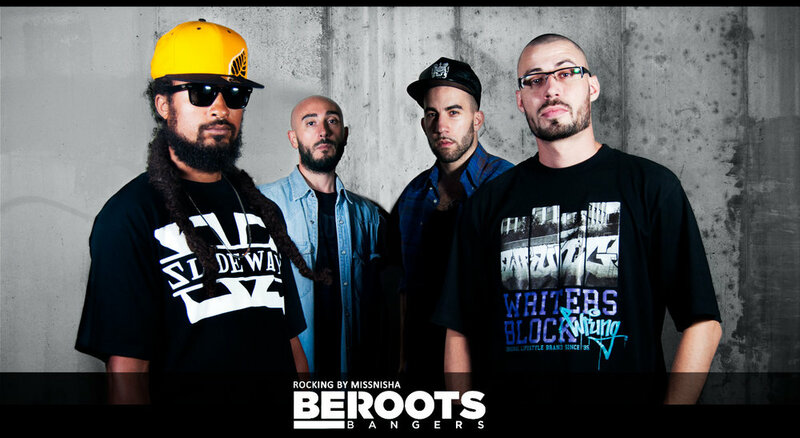 Beroots is a Spanish rap group, with a French singer, Zemo and Drako who raps in Spanish. We are now working on the second album of Beroots "Todo bien", and a concept album called "Booshido," which is a tribute to the shaolin-rap of the 90's like Wu Tang, Iam etc. Also a few solo sub-projects, but too soon to talk about. Zemo will collaborate with Jay Dilla (RIP) for sure if that's possible! Drako would collaborate with Ziontific or MDE Click (Spanish groups). And I would collaborate with those three and Kery James from France or B.A.N.G. from London for example. Anyway, it's pretty hard to answer a question like that; you can like the artist, but get down when you know the person and vice-versa. But they are artists we respect a lot. You have over 200,000 views for your Underground song, could you explain what the song is about? We have 300.000 right now. The song talks about the purity of our musical feelings. We don't care about being famous or showbiz, just let us do what we like, our life as undergrounds. We aren’t going to change that with music. We eat, spit and s*** asphalt every day as Akhenaton says, we assume that, we only do that for fun. You mean apart of toxic substances? Music for sure... primary drugs above all others! Want to hear more? For more music from the Beroots Bangers visit their bandpage.